Trailing dogs follow the route a specific person has taken in urban, rural and wildness settings by discriminating the unique smell of the search subject from other people. Trailing dogs are great for determining direction of travel a subject may have taken as well as for searching in populated urban areas. Rather than looking for any live human (like airscent dogs do), trailing dogs search for a specific person using unique chemical identifiers specific to every individual. This type of searching requires a ‘scent article’ be provided to the team prior to starting their search. 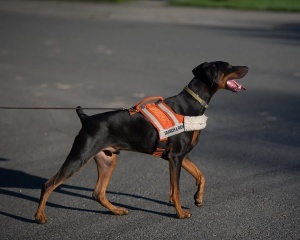 After sniffing a scent article, such as a piece of the subject’s clothing, the dogs work on a long leash ahead of their handlers and must ignore distractions and temptations such as road traffic, people and other animals. How do you train a trailing dog? 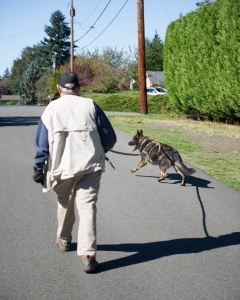 KCSD Trailing Dogs typically work on a fifteen foot or longer lead and a harness to avoid restricting breathing. When the dog finds the subject it is taught to do an indication behavior such as a ‘sit’ or ‘down’ and then great celebration and play ensues as a reward. As the dog is able to work greater distances it is encouraged to use its nose to find a subject that may be hidden just off a trail or behind an obstacle. The dog is then asked to make decisions such as which fork of a woodland trail the subject took. Gradually the dog-handler team learns to check every potential exit from an intersection and the handler discovers how to read the sometimes subtle clues a dog gives. As training progresses so does the length and complexity of the trails as dogs work open and closed areas, different surfaces and learn to ignore distractions and cope with darkness and bad weather. The dogs also start working on progressively ‘colder’ trails left by search subjects a few minutes to several hours before they start. Certified trailing dogs routinely follow scent trails after twenty four hours of northwest wind and rain in one of the most impressive demonstrations of how sensitive and precise a dog’s sense of smell really is. 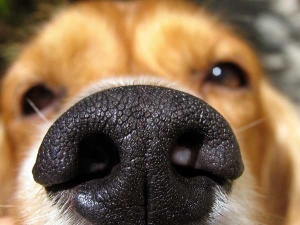 Dog noses are designed for smelling! Dogs split incoming air between the lungs and the nasal cavity and the slits at the side of a dog’s nose can be used to exhale. So air can enter through the nostrils and leave through the slits giving dogs the ability to sample a continuous flow of air.